President Nixon greets the returning Apollo 11 astronauts, 1969. 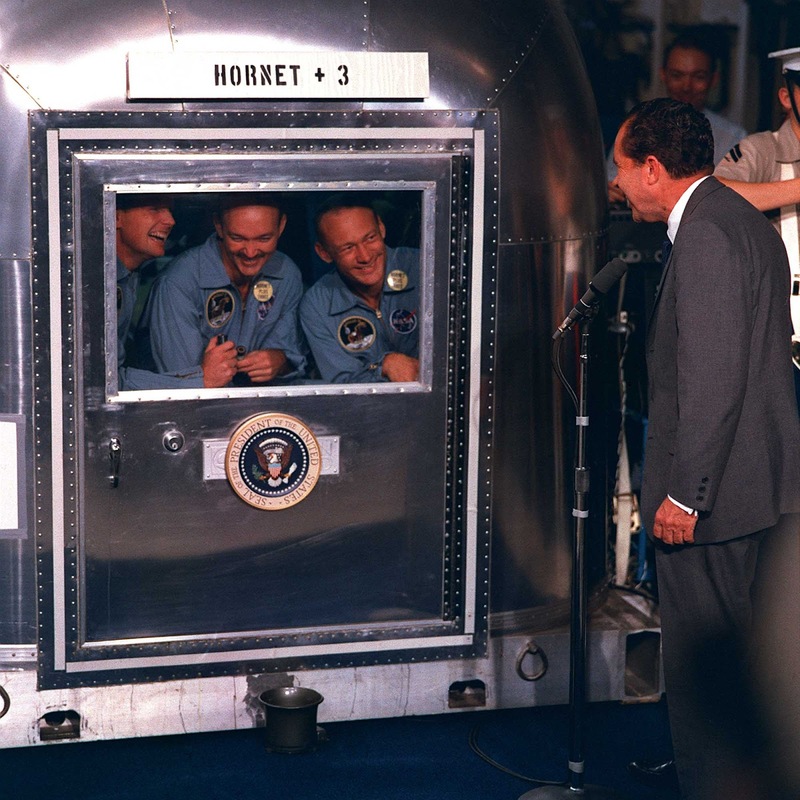 The astronauts were trapped inside a NASA trailer as part of a quarantine effort just in case they brought back any germs or disease from the moon. In the picture: (left to right) Neil A. Armstrong, commander; Michael Collins, command module pilot; and Edwin E. Aldrin Jr. Lunar module pilot. Apollo 11 splashed down at 11:49 a.m. (CDT), July 24, 1969, about 812 nautical miles southwest of Hawaii and only 12 nautical miles from the USS Hornet. Apollo 11 launched from Cape Kennedy on July 16, 1969, carried the astronauts into an initial Earth-orbit of 114 by 116 miles. An estimated 530 million people watched Armstrong’s televised image and heard his voice describe the event as he took “…one small step for a man, one giant leap for mankind” on July 20, 1969. NASA knew very little about the moon before the Apollo missions—including whether it harbored hazardous microbes or “space germs”. With this in mind, the crew of Apollo 11 was quarantined after they returned home from their lunar landing. The astronauts were required to slip into anti-contamination suits as soon as they were plucked out of the sea, and they were then sealed off for three weeks inside a converted Airstream trailer called the Mobile Quarantine Facility, or MQF. The Mobile Quarantine Facility functioned by maintaining a lower pressure inside and filtering any air vented. It contained living and sleeping facilities as well as communications which the astronauts used to converse with their families. However, years later the quarantine procedure was revealed to be more of a political move. It prevented civilians from panicking if one astronaut became sick soon after the trip. Supposedly the seal of the MQF was very bad and the astronauts joked at how badly contained they were as they could see down through cracks and fissures in the container. They even noticed ants and other insects in the cabin. The quarantine requirement was eliminated following Apollo 14 (in 1971) once it was proven that the moon was void of life (and moon pathogens) and the facilities were no longer necessary.